View More In Cake Pans - Page 5. 1 - Large Cookie Sheet 17" x 11.5" x .75" - Create a sumptuous batch of cookies using either the large or medium cookie sheet. 2 - Round Cake Pans 9" x 9" x 1.5" - A basic pie pan isn't just for pies... it's great for roasting a chicken or making a quiche, too! 1 - Square Cake Pan 9" x 9" x 1.75" - Great for cookies or bars, sponge cakes or fruit crumbles. 1 - Loaf Pan 10" x 5.75" x 2.25" You can cook everything from pound cakes to banana bread, meatloaf, and yeast breads in this standard loaf pan. 1 - Oven Crisper Pan 15.5" 13.25" x 1.25" - Treat your family to crispy, golden french fries, onion rings and more, baked to perfection without greasy deep-frying! The oven crisper pan has a special perforated design that evenly circulates and distributes heat for faster cooking without turning. Non-stick steel perforated pan is oven and dishwasher safe. 1 - 12-Cup Muffin Pan 14" x 10.75" x 1.5" If you like baking muffins and cupcakes often, then a muffin pan is an essential item for your kitchen. Experiment with flavors, textures and ingredients to find your perfect recipe. 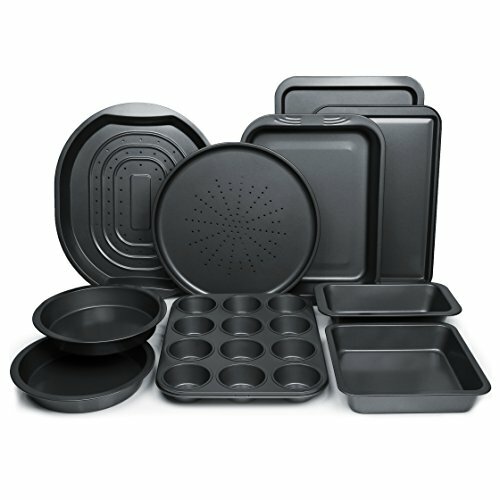 REAL COOKING BAKING STARTER KIT - Chefland's ten-piece bake-ware set includes the most popular pans needed to become a master chef. It is a basic starter kit and makes the perfect gift for an aspiring chef. It includes 1 crisper pan, 1 cupcake tray, 1 loaf pan, 1 small cookie sheet, 1 large cookie sheet, 1 round pizza pan, 2 round cake pans, 1 square pan, and 1 large roasting pan. VERSATILITY IN BOTH SQUARE AND ROUND SHAPES - This variety of durable pans in various shapes and sizes pairs with gastronomic dishes across the culinary spectrum. Whether it is a muffin, a meatloaf, pizza, or a layered brookie pie, there's a pan in here to pair with every dish out there. These pans are ideal for all kinds of cooking methods including cooking, baking, frying, roasting, sautéing, steaming, poaching, stir-frying, etc. HEAVY-GUAGE CARBON STEEL COATED WITH A SAFE NON-STICK MATERIAL (PTFE) - Top quality carbon steel ensures that these baking supplies remain rust free while the nonstick coating allows food to slide on and off and eliminates the need for cooking spray. Unlike other nonstick cookware, Chefland's exclusive bakeware are coated with a PTFE material that does not peel off with heavy use. The dark black color also improves the quality and speed of the baking process. COMMERCIAL GRADE - Proper pans and utensils are what set a professional apart from the regular home chef. Unlike the bottom of disposable pans, the smooth metal base of these baking sheets results in a feast for the eyes and palate. In addition, each non-stick baking pan in this bulk set provides even heat distribution, helping your dish become a restaurant worthy delight. This collection is compatible with standard or convection ovens; heat-safe at high temperature up to 550˚F. EASY TO USE - Each sheet is designed with extra-wide, easy to hold handles that offer an outstanding grip when transferring from oven to surface. After each use, wash with dishwashing soap and warm water or pop them into a dishwasher for fast and easy cleaning. Store in a cool dry place for long-term endurance. If you have any questions about this product by ChefLand, contact us by completing and submitting the form below. If you are looking for a specif part number, please include it with your message.